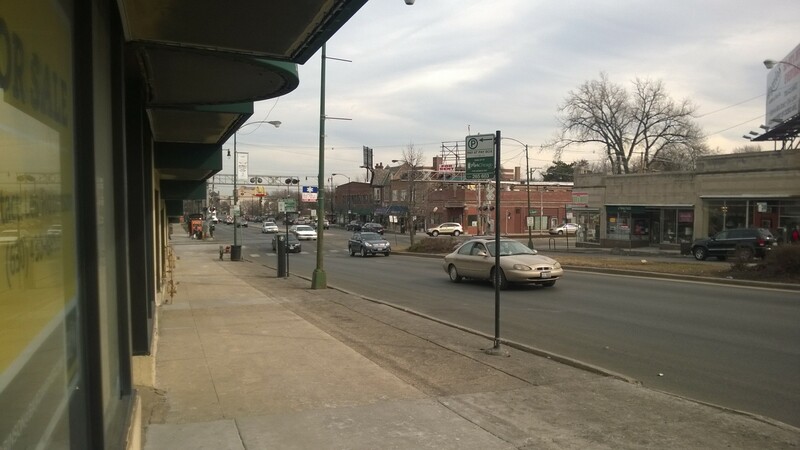 As I continue to update this blog, I plan on coming back to the subject of 95th Street often. In many ways, it is Beverly’s Main Street. But unlike a traditional Main Street, it does a poor job fostering the spontaneous interactions among people that drive social interactions and economic activity. Instead, it does a great job funneling vehicles through and away from the neighborhood. I believe that through road design, land use and other changes, 95th Street can become the thriving place it deserves to be. 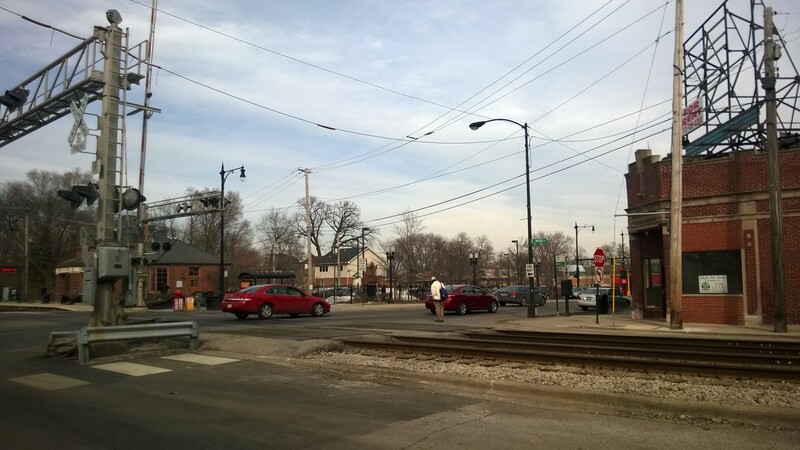 95th Street’s Metra crossing holds so much unrealized potential for pedestrian activity. In the debates I’ve read about revitalizing 95th Street, one argument arises time and again: If we just had an anchor, it would spur all kinds of development. This argument is not unique to Beverly. As a newspaper reporter, I heard this reasoning from people in communities across the Chicago area, and you don’t have to look far to read about similar discussions occurring across the country. People seemingly everywhere like to talk about some sort of silver bullet of a development or business that will reverse decades of disinvestment, decline and botched projects. This silver bullet comes in many forms. It could be anything from a grocery store to a sports arena, a new highway to a parking garage. The truth is though, that Beverly, with its abundance of pre-World War II infrastructure, already has what it needs to be a vibrant community, and it already has a fixture that serves the goal of bringing people to our neighborhood’s main street: The 95th Street Metra station. The station is the type of public asset that most communities dream of, and it’s right under our noses. Hundreds — thousands, even — of people arrive there each week, many by foot, providing the type of critical mass of sidewalk traffic small business owners love and need. We don’t need an anchor, because we have one. There are myriad reasons why the area isn’t more vibrant with activity, but a good place to start is land use. We have designed the area around this community focal point first and foremost for cars, eating up some of the most valuable, develop-able land with parking lots, strip commercial buildings and dead zones like the small park at 95th Street and Winchester Avenue (tip: you won’t have a well-used gathering place without foot traffic). Cars: 1, Pedestrians: 0. In a well-designed place, this poor guy wouldn’t have such trouble trying to cross the street to get to the train station. Shifting the land use near the station could allow for more housing variety, more feet on the street and an even greater critical mass of activity that can help support the types of business we want to see — small- to mid-scale retailers that cater to our everyday needs. The building on the left is for sale. The Metra station is right next to it. Picture residences above those storefronts and think about just how many more people that could put on the sidewalks. Our zoning needs to allow for the development of buildings that contain retail or office space at the street level, apartments above and a minimal amount of parking (there is an abundance of both on- and off-street parking along 95th Street and just off it that is sorely underused). Residents can choose to live here without a car or with just one car and commute downtown via Metra, while business patrons can walk, bike, take public transportation from other neighborhoods or, yes, drive and park in one of the many spaces nearby. The idea that we can simply lure an “anchor” to the area that can draw people from afar and revitalize the street is a fallacy, especially if we assume most trips to this place will be by car. Planning to draw people in with more parking will further degrade the very public realm we are seeking to activate, and in the long term, it will make the area even less attractive of a place to spend time. Case in point: Borders. At one time, Borders was probably a wonderful amenity for Beverly. I personally have fond memories of spending many a Friday night browsing the shelves of the Borders near my childhood home (well, 30 minutes away) and heading home with a bagful of new music. However, even while the Beverly Borders was open, it did not singlehandedly save the neighborhood. Its positioning on the street — a front door faces away from the public realm toward a parking lot that occupies nearly two full blocks — ensured that those who arrived at Borders went only to Borders. It, in fact, deadened the street and area around it, a fact that became even more pronounced after the business closed. What we are left with is a hole in our streetwall in the form of a parking lot and an excessively large building that does not easily lend itself to adaptive reuse. Successful Chicago neighborhoods redeveloped from the inside out. These neighborhoods reached their full potential because people built on the assets they had, such as a varied housing stock, access to public transportation and a well-constructed network of buildings, streets and sidewalks that all together created an attractive public realm. They did not bait a big box store to open nearby or throw money at a vanity project hoping that it would reverse their fortunes (and they certainly did not expand parking before there was a demand for it). Beverly, to use a tired but appropriate phrase, has good bones. It has a solid street network, good transportation options and high-quality neighborhoods. We just need to refine them to help them function at their full potential. The census tracts in Beverly and Morgan Park generally have relatively high median incomes, but they don’t have the require density. You are onto something with the zoning. The land along streets like 95th St and Western Ave needs to be upzoned to allow more housing development. I liked taking my kids to the Borders at 95th and Leavitt and was really disappointed when it closed. Maybe a victim of the digital age, maybe a victim of putting the Starbucks on the east side of the main floor. The Starbucks seemed to have a lot of traffic, it was adjacent to the discounted books and magazines. What I noticed was that although there were a lot of people having coffee and discussions, there didn’t seem to be many there purchasing books. Before finding your blog, I saw a reference to it on the DNAInfo.com site. There was a mention about developing rental housing and it struck me that the mostly single family units you find in Beverly stablize it as a community. If you talk to some of your long time neighbors, they would tell you that Beverly had started a downhill decline in the late 60’s-early 70’s. As such, many of the large homes along Longwood Drive and Seeley could have been purchased for a fraction of their current value. The large and unique style of homes attracted many young people to the area who still live here today. Understanding young couples often lack the downstroke to make a home purchase and are forced to rent is an understandable option. Whether or not those renters would plant their roots here as future home buyers is an unknown. While the value of homes in Beverly rivals anywhere in the City, a lot of college graduates from Beverly are opting for the regentrified areas of Lincoln Park Wicker Park and Bucktown. As you discuss the business climate of 95th Street, I always thought it interesting that there was once a McDonalds on the north side of 95th between Damen and Western. Sadly, and to me, most unusually, it went out of business. Anyway, keep up the good work, I’m glad to have found your blog. Hi Jim, thanks for the comment! I used to love going to Borders. I grew up in Antioch, and the nearest one was in Gurnee, about a half-hour away. I agree that it was always a great place to linger, but I think it and a lot of businesses like it were impacted by the digital age. However, when I was reporting, a lot of people I would talk with always expressed a desire for a small, neighborhood bookstore to open in their downtown. I think that speaks a lot to the type of environment people are looking for. I don’t think people mind paying $30 for a couple books if it means they can walk out their front door, meet some neighbors on the street, go to the store and make a nice day of it. In other words, I don’t think Borders didn’t work for the neighborhood because it’s Borders. I think the issues were more with the building, the street design and the parking lot. Large retailers have successfully moved into other walkable neighborhoods, but they have done so by weaving their buildings into the fabric of the street. Heck, there’s even a Home Depot smack dab in the middle of Halsted Street in Lincoln Park. These places didn’t replace a block of existing buildings (maybe just a couple buildings) — they grew upward rather than outward. As for apartments, I think they are one part of a successful neighborhood. Beverly today is not the Beverly of the 60s and 70s. It is a fairly in-demand neighborhood. Historically, when a place was in demand, it grew to accommodate all the people who wanted to live there, and as a result, businesses and public places thrived. Places grew incrementally. Small houses became 3-flats, 3-flats became 6-flats, 6-flats became courtyard buildings, and so on. This is healthy, as it helps grow the tax base and puts more people on the streets visiting local businesses. It also provides options. Even neighborhoods like Roscoe Village and Lincoln Square have a mix of single-family homes, apartments, condos, townhouses, etc., and I don’t think anyone would think of those as unstable. They do provide options for people at various stages of their lives and for people who might just not want to own a house but want to live in a place with good schools, amenities, etc. We have room for more of this without dramatically changing the character of our neighborhood. One other thing: A variety of housing options can help provide for people at various stages of life as well as those who simply don’t want to own a home but want access to good schools, amenities, etc. The major problem with 95th Street is that it is a State of Illinois route and under their jurisdiction. If you look east and west of the section of the street through Beverly you will notice what the State wants, essentially a wide, four line highway that serves as a truck route. The State has long viewed our portion of 95th Street as a bottleneck and has made attempts to widen the street and ban parking to improve the “flow”. That the city managed to have medians placed in the street is a minor miracle. As long as transportation planning focuses on moving cars and trucks there will be no changes in how 95th Street functions. A very well written and thoughtful post! The problem with 95th Street being a highway is well noted above. But your mention of transit points out an important deficit in the neighborhood and that is that with the exception of White Sox a Travel on Metra, nearly all of our options are Journey to Work or School based and except for the lucky few near 95th street, very little supports shopping, medical and leisure trips. That’s because their is no North-South transit other than On Vincennes and Western, when Metra trains have long gaps in service. Further, there are no transfers from Metra to CTA increasing the cost substantially. When the X49 was created, a limited stop express bus service that could have linked Beverly to the CTA Orange Line at significantly faster speeds than local bus service, attempts were made to discuss running the service east on 95th Street to Longwood with either local stops or stops every half mile. With schedule coordination the buses could have run Northbound a few minutes after Metra Trains were scheduled so that those who had just missed a Metra connection would not have to wait a significant amount of time to get downtown. These would have run more frequently than Metra trains though and connected those Far from North-South and distant from East-West options a way to get to the Medical Buildings on Western near 98th and 97th. The service could even have operated as a complete circulator, 95th, Longwood, 119th, Western – with a rest stop on Western operating only in one direction on Longwood Drive to reduce traffic, Nortbound in the AM and Southbound in the PM. If the service was popular it could have operated in both directions for a few trips. Even though CTA had proved it could operate safely on narrow neighborhood streets with the University routes it operated for the University of Chicago in Hyde Park in extremely narrow conditions. The previous Alderwan was unwilling, afraid(?) to even open up the idea of any sized buses on Longwood drive no matter what services it provided to the retired, students and stay at home Mom’s in the community. 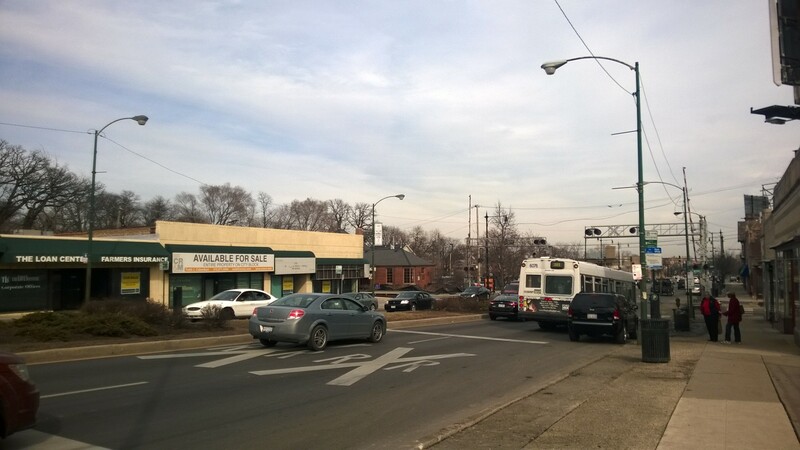 The presence of the Metra line IS a key to the stability of the neighborhood. However, it puts a great deal of traffic and parking pressure on the neighborhood without returning any economic benefit to the neighborhood for the cost of all those suburban commuters coming here. One option would be to ask Metra to Levy an out of area fee for those who don’t have City Stickers to park in the lots from 91st to 119th. Perhaps a $1 daily fee, a $5-$10 monthly fee and a $40 annual fee. The revenue used to pay for a neighborhood circulator looping as described before. (A south end of 119th might be an option.) if smaller vans were used it could even be a dial a ride van service. I mention this because the lack of easy access to both Western and 95th streets without an auto is one of the reasons those storefronts go vacant and only auto-oriented businesses seem interested in opening there. Solve the problem of neighborhood access to these streets and you solve the problem of attracting more pedestrian friendly tenants. The problem with 95th Street being a highway is well noted above. But your mention of transit points out an important deficit in the neighborhood and that is that with the exception of White Sox travel on Metra, nearly all of our options are Journey to Work or School based and except for the lucky few near 95th street, very little supports shopping, medical and leisure trips. That’s because there is no North-South transit other than on Vincennes and Western, when Metra trains have long gaps in service. Further, there are no transfers from Metra to CTA increasing the cost substantially. When the X49 Western Exbress bus was created, a limited stop express bus service that could have linked Beverly to the CTA Orange Line at significantly faster speeds than local bus service, attempts were made to discuss running the service east on 95th Street to Longwood with either local stops or stops every half mile with the current Alderman. With schedule coordination the buses could have run Northbound a few minutes after Metra Trains were scheduled so that those who had just missed a Metra connection would not have to wait a significant amount of time to get downtown. These could have run more frequently than Metra trains though and connected those far from North-South and distant from East-West options a way to get to the medical buildings on Western near 98th and 97th. The service could even have operated as a complete circulator, 95th, Longwood, 119th, Western – with a rest stop on Western operating only in one direction on Longwood Drive to reduce traffic, Nortbound in the AM and Southbound in the PM. If the service was popular it could have operated in both directions for a few trips. Even though CTA had proved it could operate safely on narrow neighborhood streets with the University routes it operated for the University of Chicago in Hyde Park in extremely narrow conditions, the previous Alderwan was unwilling, afraid(?) to even open up the idea of any sized buses on Longwood Drive for discussion; no matter what services it could have provided to the retired, students and stay at home Mom’s in the community, as well as the workers who had destinations other than Downtown.